When the doors open for Free Comic Book Day — an annual event that's grown in stature from a few stores to some 2,000 worldwide — publishers and purveyors of tales of heroes and villains will court new readers who, despite the ease of digital displays, are making time for and spending money on comics printed on paper. 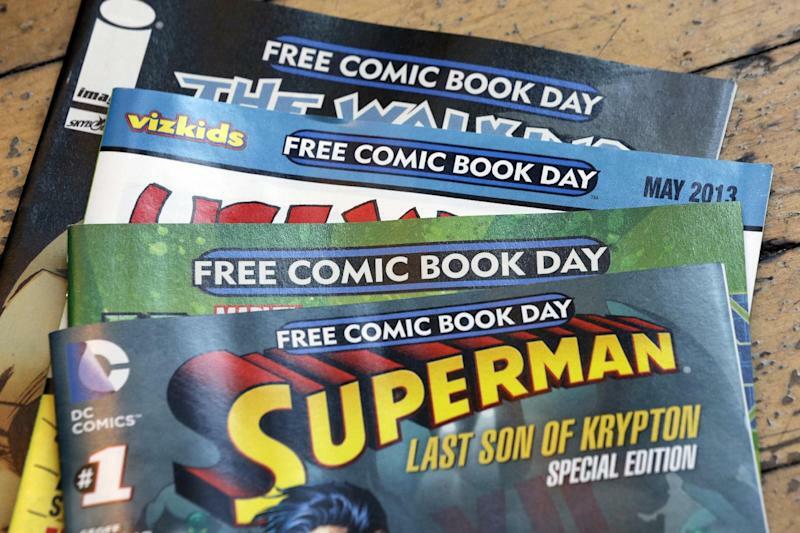 Retailers say the turnout and scope of the event, which began in 2002, is giving them and the industry a chance to tout their success by giving away 4.6 million comic books featuring everything from Superman to "The Walking Dead" to Gilbert Hernandez's "Marble Season." It will be held on Saturday. 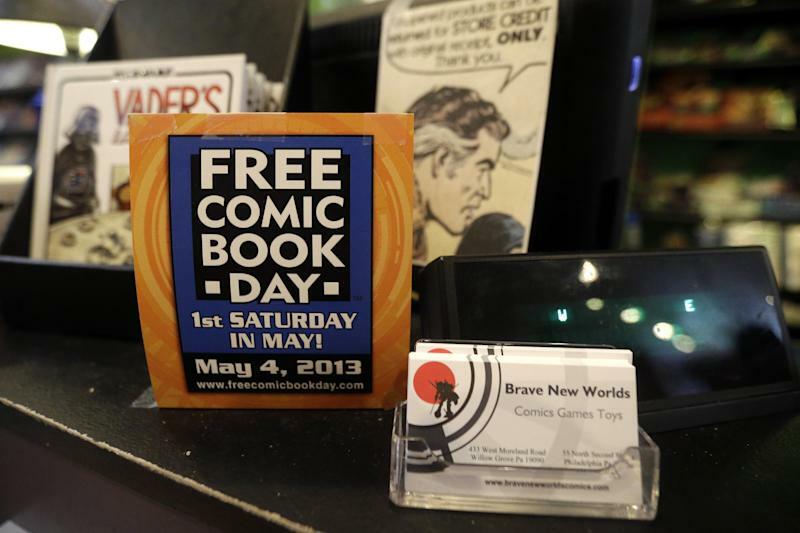 It's also a chance to extol not just comics as an art-form, but as a nexus of pop culture, too, said Joe Field, who organized the first Free Comic Book Day in 2002 and has been its chief architect and No. 1 proponent ever since. 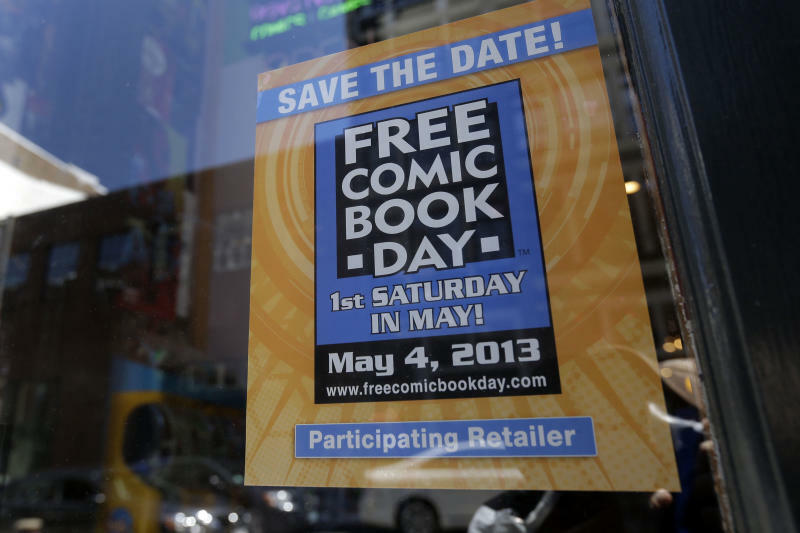 "That really is the crux of Free Comic Book Day, inviting people into these shops that are really social hubs for people who like anything that's going on in popular culture," he said this week. It's also a time for the industry to tout its growth, in print and online. Among print-based products, from magazines to books, comic book publishers big and small have been posting steady gains in sales and increases in issues. John Jackson Miller, who tracks industry sales figures and estimates through his www.comichron.com website, said that sales of single-issue comic books were up nearly $60 million to $474.6 million in 2012, compared with $414 million in 2011 and $310.6 million in 2003. Miller said that digital sales of comics were an estimated $75 million in 2012 compared with about $25 million the year before. "It's definitely tripled," he said of the gain. "The growth in digital sales has been substantial and the heartening thing to everyone in the business is that it happened alongside gains in print sales. There is no evidence whatsoever that the digital availability of comics — released the same day as the print comics — is pirating sales from the other." "We haven't seen a pendulum swing between print and digital," said Dan DiDio, co-publisher of DC Comics. "Since the launch of the New 52, we've made a very strong effort to embrace the digital market as well as the print market," he said of DC's relaunched universe of characters, including Batman, Katana and Animal Man, among others. "Both of those markets have shown a level of growth and that's helped us let retailers know that (digital) is supplementing the print. It brings readers to the stores." That, he said, is a reflection of how digital comics are often downloaded by new readers who may have seen a comic-inspired film or TV show, and then they want more and head to a comic shop. It's a sentiment shared by Dan Buckley, publisher and president of Marvel Worldwide Inc.'s Print, Animation and Digital Division. He called the relationship between digital and print "symbiotic" to the core and indicative of demand for pop culture entertainment in a variety of media. "The ultimate mobile device is a comic, not just your mobile device," he said adding that comics that have become movies — Iron Man, Batman and others — help drive interest in the books in digital and print. "It's feeding into each other." Sarah Titus, co-owner of The Comic Shop in Wilmington, Del., said that since the onset of digital comics, she's lost just one print customer: her doctor. "But he's computerized everything" she said, laughing, adding that digital comics are a great way of "introducing readers to new books and to the medium in general" that's pulling people into her shop." And going to the shop is a strong lure for many readers, who tout it as a place to relax, talk and explore. "There is nothing like walking into a comic book store and looking through books and buying them. It's one of my favorite things in life," said James Kuroda in Los Angeles." It's why I go once or even twice a week. I feel at peace and full of happiness inside a comic store!" Field calls Free Comic Book Day the chance for first-timers to experience the atmosphere of a comic shop, and the camaraderie of comics readers, to be among like-mind fans and friends and share in the pop culture origins of heroes and villains that have become television and movie staples. "Its mind boggling to me that we are in this period of such amazing creativity and growth in the business, Field said. "What's happening in the stories themselves is exciting enough people to want to search out comics in whatever format they come in." Steve Anderson, whose Third Eye Comics opened on Free Comic Book Day five years ago in Annapolis, Md., calls his shop, and others, more than stores. "These are hubs. These are communities that give people an outlet to celebrate something they're passionate about," he said. For readers, going digital or remaining with print is a matter of personal preference. Some favor digital because of its sharp colors and portability. "I can carry the entire run of 'Detective Comics' in my pocket," said Chris Romanoski of Buffalo, N.Y. "I read all my comics on the Kindle, or the laptop." Others prefer print for the tactile feeling that comes with it, said John Signer-Romero, who began reading comics when he was a boy and will spend Saturday with his "nerd-tastic comic book shop family at Astro Zombies" in Albuquerque, N.M.
"There is just something wonderful about the thrill one gets when you have just read a particularly awesome scene and you know something big is going to happen on the next page," he said. "Comics are filled with wonderful moments and the thrill one gets from turning that page slowly and having a whole world unfold in front of (you) is brilliant." Moore reported from Philadelphia. Follow him at www.twitter.com/mattmooreap.